A specter is haunting the sports-industrial complex in North America—the specter of inexplicably angry mascots. I first noticed this trend while matriculating at Ohio University in the mid-90s. When I got to Athens in 1993, the Bobcats were mostly represented by a green pawprint, and a 50's style cartoon Bobcat named, Rufus. In 1996 the university athletic department unveiled it's new and completely generic looking mascot: The Attack Cat. An angular (and angry) floating head of a mascot, the Attack Cat lacked all the important things that its predecessor had: personality, emotional connection, and chummy appeal. It’s a bit like when Coca-Cola introduced New Coke back in 1985: it was a marketing and ad buy that was pretty unprecedented (in my lifetime). And then it flopped! So the classic logo was brought back as just that, Coca-Cola Classic, and New Coke was sent to an early grave. Eventually the “Classic” was dropped. We have the same old thing again, and everyone would prefer you not bring New Coke up, ever again. There is an itch that graphic designers have—and creative people in general, and also non-creative people, come to think—that more or less resolves to an abiding urge to tinker. This persists, troublingly, even if that something is working just fine, and this seems to happen more often in logoland than just about anywhere else. Under Consideration catalogs this iterative process better than any other site, and shows the new right next to the old. The Metropolitan Museum of Art, of all places, recently unveiled a new logo that was trounced by popular opinion, and left many wondering why an iconic art museum could possibly need a rebrand. The Girls Scouts of America recently spent a couple hundred thousand dollars giving Saul Bass’ iconic logo a nose job and not much more. So it always goes. The angry animal logo trend, which feels like the trickle-down effect of too many energy drinks, and an OD of xtreme sporps, and the general tyranny of focus group-led design has watered down the mascot landscape. The result is a glut of nightmarish pelicans and pissed-off dolphins. The solution to this problem is, paradoxically, also something like its source—designers can always do better. Aaron Hadley Dana, a friend of The Classical and sports illustrator whose work you have probably seen, became just such an agent of change. He did it by drawing the new mascot for the Charles River School. We talked about the Otter, what kind of thought process goes into designing a mascot, and where the field is (maybe) headed. Eli Neugeboren: What is your connection to this logo, this institution? Aaron Dana: In addition to my work as a freelancer, I am a part-time art teacher at the Charles River School, an independent PK-8 school in the suburbs of Boston. While I’m a relatively new faculty member there, I have been on the artistic faculty of the school’s summer program, the Charles River Creative Arts Program, for over a decade. It’s an important community in my life. At the end of my first year of teaching, our (then) new Head of School announced that she wanted CRS to have its first ever mascot. I was excited and I approached her immediately afterwards about getting involved. Soon after the announcement, a call for nominations went out to students, faculty, parents and alums. Within a month, the community had submitted a short list of ideas: Navigators, River Hawks, Explorers, Owls, and Otters. Otters got my vote; it seemed like the most original and graphically alluring option, by far. I also liked the characteristics the otter represents. It’s scrappy, but also playful, smart, and resourceful—perfect for our school. As of yet, the Otter is unnamed. It turns one year old this coming October, so hopefully we can figure out a great gender neutral moniker by then. EN: Did you feel an extra level of responsibility and pressure given that you will be around it all the time? AD: Yes and no. I think that’s always a challenge as an artist. I often have a hard time looking at things I made a few months ago, let alone years. Over time, you learn to let that go, though. At any point in time there is, necessarily, only one “best thing I ever made.” The inverse is that virtually everything you’ve made is not your best work. It sounds funny, but if you think like that it takes a lot of pressure off and allows you to have fun and do the best you can. That said, I was uniquely motivated on this project. The pressure was a lot less about my own expectation than that of the kids; I really wanted to make something they would love and feel proud of. So long as they were excited about it, I was going to be happy—if it ended up as something I wanted to wear on a t-shirt, all the better. The project had some pretty specific design challenges. First and foremost, the character needed to look tough, yet tonally appropriate for all ages. We went back and forth on this a lot at the sketch stage- softening a more aggressive take, hardening a sweeter version. On a personal level, I was looking to create something that would age well; I tried to combine contemporary and classic mascot elements while avoiding specific design trends. Drawing the Otter by hand was important to me; beyond the fact that it’s how I work most comfortably, the small inconsistencies in a hand drawn mascot hearken back to a pre-vector design world in which characters had more, well, character. I wanted to combine curves and sharp angles to reference both the physical nature of a river otter and the speed and direction of an otter’s underwater movements. The Otter’s tail presented an interesting challenge and eventually, opportunity. If you’ve ever looked at an otter IRL, it’s hips and tail area, though powerful, looks kind of dumpy. It was hard to figure out how to make this part of the animal distinctive and reality-based, but also athletic. In the end, I cheated and dropped the type right across it’s hips. In doing so, I was able to make use the tail as a design element—I think it gives a nice sense of motion to an otherwise static image. I don’t know how good or bad the overall design is (it’s tough to be objective) but I checked off everything on my to-do list and feel generally pretty good about it five months later. The creative process was fairly streamlined and done under complete secrecy. We wanted to preserve a reveal for the kids and the community, so no announcement was made after the votes were tallied. I worked directly with the school’s admin team and, over the course of a few meetings and dozens of emails, the final design was approved. I was thankful to have worked with such a small team of decision makers; it’s so hard to build consensus when lots of people get involved. We made one change at the very end—the Otter originally had one finger raised, a la Tony the Tiger. In the end, it felt too boastful for this particular school. Thus the hands on the hips. EN: I think maybe Olympic mascots are the extreme examples of focus-grouping things to death and appealing to no one because you’re trying to appeal to everyone. You said, “First and foremost, the character needed to look tough, yet tonally appropriate for all ages.” I wonder why, in an era when we sports are trying to expand their markets and appeal to everyone—not just in a pedantic way with a pink version of the regular jersey —why this isn’t a universal requirement? Is it because we’re in a constant state of war and our mascots need to reflect our national angst and bellicose tendencies? Or just an aesthetic trend influenced by technology (vectors)? AD: I’m not sure what goes on behind closed doors, but it’s hard to ignore the increasing aggression/militarism of the American sports landscape. It feels like the goofy, innocent mascots of yesteryear have been grandfathered in, but it’s hard to imagine a professional team going “softer” in a rebranding effort in the current climate. 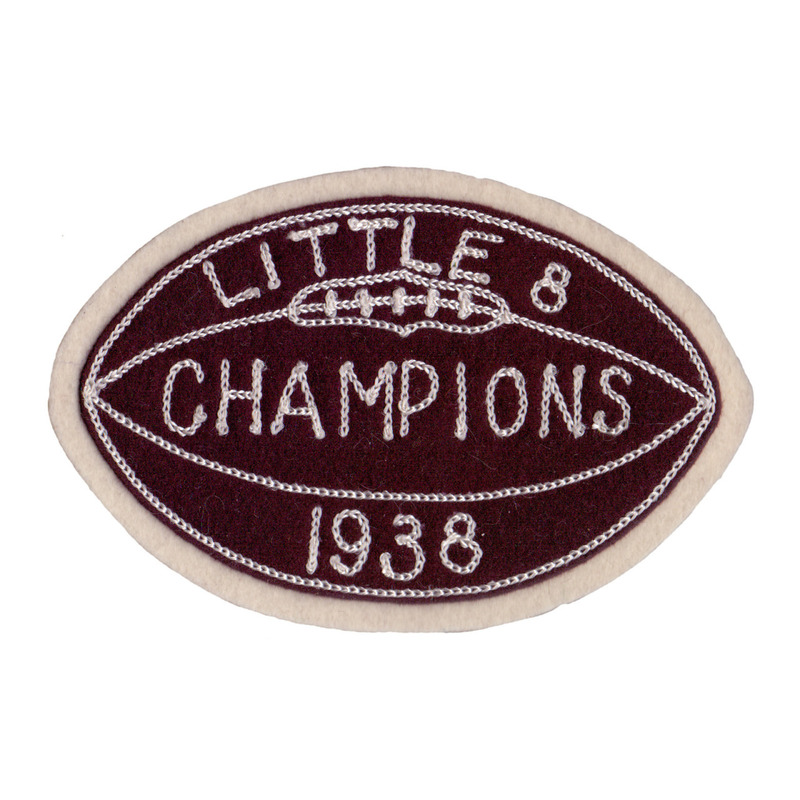 EN: Talk about your collection of old sports patches and other sports-related ephemera. What is the appeal for you and is it limited to the aesthetics or is there a psychological and nostalgic appeal as well? AD: I spend a crazy amount of time thinking about, seeking out, and poring over sports graphics of all varieties—baseball cards, jerseys, programs, pennants, caricature tees, you name it. I think they provide an interesting lens through which to observe the evolution of American society and culture. Of my many collections, my favorite is my collection of vintage and antique varsity letters and mascot patches. Chenille terry loop, chain-stitching, embroidery, heavy felt, single needle detailing, screen printing—they represent an incredible tactile experience. Stylistically, they are incredibly varied—straight letters and scripts, crudely drawn characters, weird piping, crests. It’s an obsession. I think I like high school patches the best because of their anonymity—unlike professional or even college teams, I have no preconceived notions about these schools, teams or communities. They are a total mystery, which is really fun; a connection to a vague and uncertain past. I recently created an online gallery over at sportpatch.tumblr.com. Right now, it’s all samples from my own collection but I hope it can become a community space over time—I’m actively seeking submissions and contributors! EN: How much did you obsession/collection come into play during the design process for this mascot? Were there specific pieces in your collection that you kept coming back to for inspiration? What, specifically, were you borrowing for the new creature? AD: When you look at enough stuff, you start to figure out what you like and don’t like. I’ve had a semi-conscious list of favorite sports design styles and qualities building up in my head since I was a very young child. I don’t think I specifically referenced anything from my collection when I worked on the Otter, but it’s all up in the attic, so to speak. I did, however, reference a few prominent mascots in my thinking about the project, and in the way I pitched ideas to the school. Bucky the Badger (Wisconsin) and Sebastian the Ibis (Miami) are both quirky, non-predatory animals in funny poses, and provided a nice context for conversation as such. EN: What do you think about current trends in American mascot/logo design? Are there any countries/regions/leagues that are doing a better job than the USofA? AD: To be clear—I am not a mascot designer, nor a designer at all, really. My work is primarily editorial and advertising-based illustration. While much of my work revolves around the world of sport, I don’t purport myself to be the Mona Lisa Vito of sports branding, as she was in the car-expertise area—I’m just an impassioned observer. That said, I think there’s good and bad stuff happening at home and abroad, at every level. I don’t think any country or league is exempt from terrible design choices; by the same token, many redesigns that I wasn’t crazy about at first have really grown on me. I think more to your point, though—it’s a copycat business and the look and feel of sports branding grows increasingly homogenous, which is sad. To draw a sports analogy, I’d rather see someone swing for the fences and strike out than watch bloop singles all day. The trend towards the aggressively generic—the “Angry Birds” school of design, I think you called it—is a bummer. While most of their logos are objectively pretty bad, the world of Minor League Baseball branding is an interesting slice of the pie. Much like the pre-merger ABA, minor league cities are guaranteed very little. In-game promotions and post-game events factor heavily in terms of getting fans in their seats; teams foster a family-friendly atmosphere as much out of necessity as desire. These factors seem to create a culture in which teams take more chances and allow themselves to get a little weird. The Montgomery Biscuits and The Cedar Rapids Kernels couldn’t exist anywhere at the Major League level; come to think of it, no high school would name themselves that either. It’s a funny little pocket, and I appreciate it. AD: I can’t, for a few reasons. First, Lucky is associated with winning and tradition, unlike our guy Pat. The Lucky we all know and love is actually a redesign of the weird jester-like leprechaun associated with the team in the 50’s and 60’s. Second, and most importantly, while he’s old-timey to be sure, Lucky is actually a pretty clean character. While I love Pat nostalgically, I recognize that an update was needed. The drawing was pretty rough, and looked like it had been fed through a bad photocopier once or twice along the way. Why the Flying Elvi was the chosen solution is beyond me. It has to be in the bottom five-to-ten percent of professional American sports logos.